Edward Fisher, Robin Youngs, Musheer Hussain, Jonathan Fishman,	The Journal of Laryngology & Otology, Volume 132 Issue 1, p 1. J Powell, S Powell, A Robson,	The Journal of Laryngology & Otology, Volume 132 Issue 1, pp 2-7. J Mansour, D Sagiv, E Alon, Y Talmi,	The Journal of Laryngology & Otology, Volume 132 Issue 1, pp 8-13. P D Chakravarty, A E L McMurran, A Banigo, M Shakeel, K W Ah-See,	The Journal of Laryngology & Otology, Volume 132 Issue 1, pp 14-21. N M Kaper, K M A Swart, W Grolman, G J M G Van Der Heijden,	The Journal of Laryngology & Otology, Volume 132 Issue 1, pp 22-28. 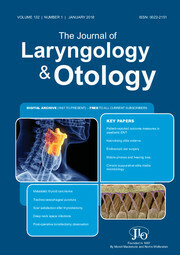 D Sagiv, L Migirov, O Madgar, G Nakache, M Wolf, Y Shapira,	The Journal of Laryngology & Otology, Volume 132 Issue 1, pp 29-32. I B Arslan, G G Aslan, G C Mercan, S Vatansever, I Cukurova, S Gokalp, A Aslan,	The Journal of Laryngology & Otology, Volume 132 Issue 1, pp 33-40. M R Mofatteh, F Shahabian Moghaddam, M Yousefi, M H Namaei,	The Journal of Laryngology & Otology, Volume 132 Issue 1, pp 41-45. S Morris, E Hassin, M Borschmann,	The Journal of Laryngology & Otology, Volume 132 Issue 1, pp 46-52. O Gallo, G Mannelli, M S Lazio, R Santoro,	The Journal of Laryngology & Otology, Volume 132 Issue 1, pp 53-59. P Sethukumar, D Ly, Z Awad, N S Tolley,	The Journal of Laryngology & Otology, Volume 132 Issue 1, pp 60-67. Endoscopic ear surgery in the ear camp setting; forward thinking or folly? M P A Clark,	The Journal of Laryngology & Otology, Volume 132 Issue 1, pp 68-70. S Unadkat, T Kanzara, G Watters,	The Journal of Laryngology & Otology, Volume 132 Issue 1, pp 71-74. J A Bellairs, M B Gluth,	The Journal of Laryngology & Otology, Volume 132 Issue 1, pp 75-78. O Erdur, K Ozturk, K Erkan,	The Journal of Laryngology & Otology, Volume 132 Issue 1, pp 79-82. M K Alwashahi, P Battaglia, M Turri-Zanoni, P Castelnuovo,	The Journal of Laryngology & Otology, Volume 132 Issue 1, pp 83-87.